We continue to receive questions about the impact of the recent dollar strengthening on the US economy. 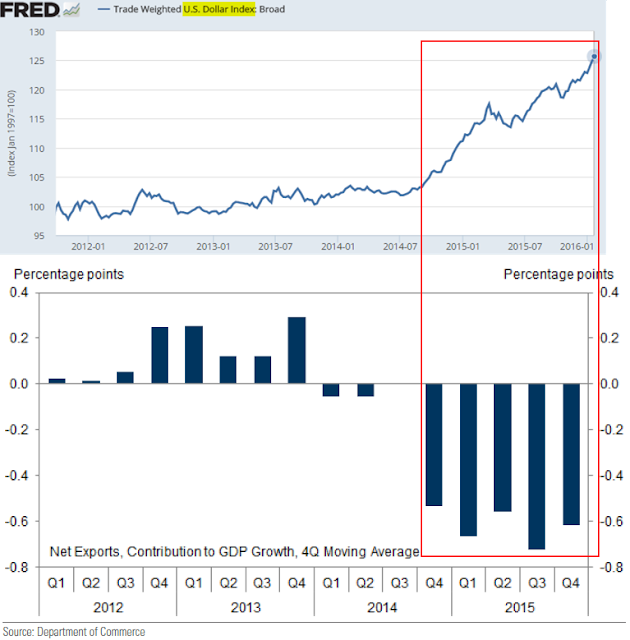 The most immediate impact of course is on trade, which has created an immediate drag on the GDP growth. We know that the impact on US industrial production in particular has been terrible. On the other hand this currency appreciation, combined with weaker energy prices, is supposed to improve consumption as imports become cheaper. 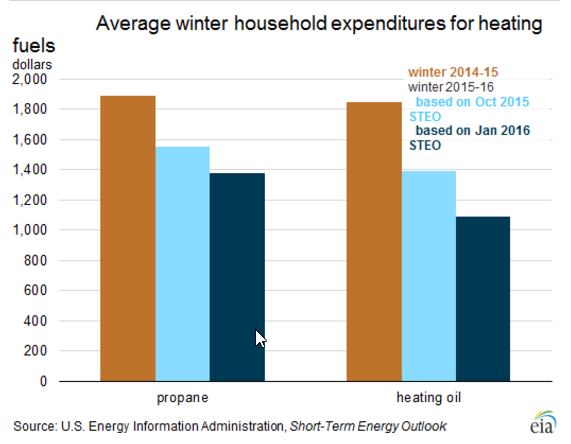 And of course all the cheap fuel (combined with a warmer winter) should be providing material support to US households. 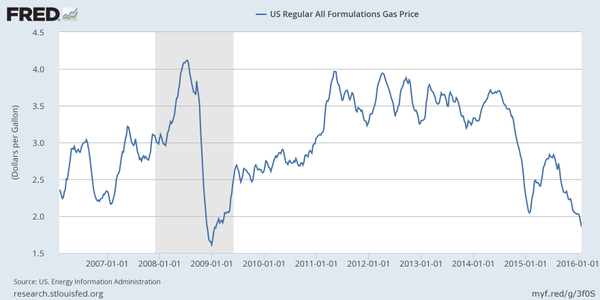 Will that be enough to give US consumer spending a boost? 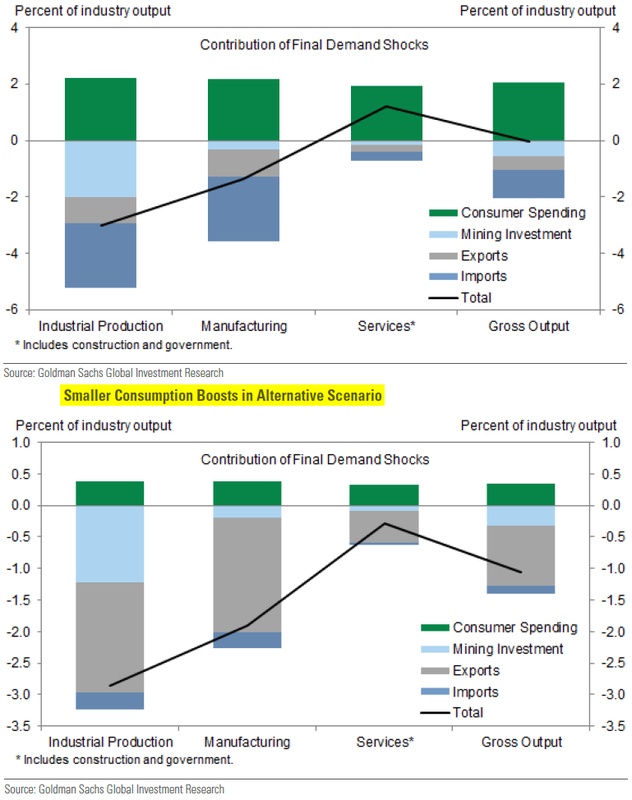 Goldman outlines two potential scenarios, the second one of which leads to a contraction in US gross output. The full impact of the US dollar rally thus depends very much on the behavior of the consumer in the months to come. 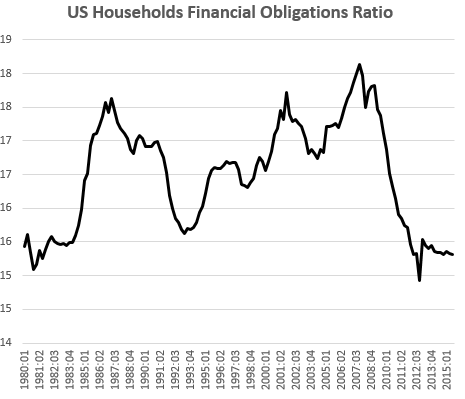 From a balance sheet perspective US households certainly don't seem to be "stressed", as the Financial Obligations Ratio remains near multi-decade lows. Moreover, high-frequency economic sentiment data, while showing some stock-market induced jitters, remains robust. Whether this will translate into stable spending patterns remains a question. According to Gallup, at least through December, US consumer spending has been solid. The equity markets however are now pricing in a much weaker discretionary spending pattern, while companies focused on staples seem to be doing much better. Note that much of the divergence has taken place this year. Is the market concerned about consumer retrenchment? The December GDP report (0.7% growth) showed that growth has already slowed as financial conditions tightened. 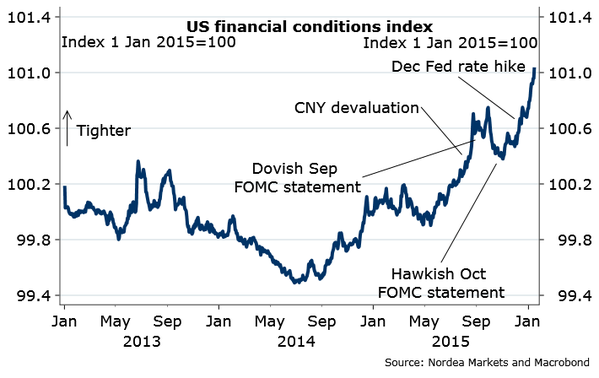 A great deal of this tightening has been driven by the US currency appreciation. Consumer spending stability in the next few months is therefore critical. Strong US dollar has created a significant drag on economic activity but economists are betting that the consumer tailwinds should support growth,. If however the consumer (spooked by the recemt sharp correction in the equity markets) retrenches, US growth could stall.